Unforgiven brought Eastwood to a whole new level of filmmaking and changed the concept of the old westerns. Munny is a flawed yet human character anyone can relate to and Hackman’s performance is nuanced. Usually when you think of a western movie you think of horses, gunslingers, saloons, and cowboys. 1992's Academy Award winner for best picture, Unforgiven, has all that and more. With Clint Eastwood (Gran Torino) at the helm, both directing and starring in it, the movie opened to well deserved critical praise and became an audience favorite. Twenty-five years later, since technology has advanced, Warner Bros. has once again decided to release the movie on Bu-ray, 4K Blu-ray and digital download. William Munny (Eastwood) was one of the worst outlaws there was with a reputation for not caring about anything, least of all himself. He was known to terrorize western towns and kill dozens of people at one time including women and children (or so they story goes). However, that all changed when he met his wife who helped him get sober, clean up his life, stop robbing and killing and settle down. After two children together she, unfortunately, died leaving William to raise their kids and man a struggling homestead. Down on his luck, he is reluctant but intrigued when a young gunslinger named the Schofield Kid (Jaimz Woolvett; Joan of Arc) shows up talking about some whores in Big Whiskey offering a reward for anyone who will kill the cowboys who cut a girl. Warring with his own demons, Munny eventually enlists the help of his old partner Ned Logan (Morgan Freedman; The Shawshank Redemption) and the three of them make their way to Big Whiskey. When they get there, they find the whores and a whole lot of trouble in the form of the Town Sherriff, Little Will (Gene Hackman; The French Connection), who likes to violently remind everybody that firearms are not allowed. When Munny kills one of the two cowboys, The Sherriff and his team capture Ned and beat him to death, which sets Munny into a silent rage vowing revenge. With the climatic standoff at the Brothel/Saloon, Munny reminds everyone why he was once notorious leaving dead bodies all over the floor. There are so many things to love about this film it's hard to know where to begin. Eastwood had previously made somewhat of a name for himself as a director but this was his best work as evidenced by his Best Director Academy award. His use of the terrain enhances the fell and his attention to detail is exacting which pays off as every movement and bullet has a purpose. The cast is exceptional and Hackman does some of his best work (also winning and Oscar for best-supporting actor) as the amoral Town Sherriff. His bubbling anger kept just below the surface is subtle and sublime. Supporting members such as Richard Harris (Gladiator), Frances Fischer (Titanic), and Saul Rubinek (Warehouse 13) give the film a realism and authenticity not often seen in westerns and I think that is one of the things I liked most about the movie. I got a sense that this was really how the old west was; a sort of chaos and lawlessness disguised as order. My least favorite portions include the score, the pacing, and the 4K transfer. While James Horner (Titanic) is known for excellence in movie music, this one just didn't work for me. The main theme kept reminding me of a Josh Groban song that I couldn't quite put my finger on and, while I'm a fan of Groban, the score just didn't fit this dark and at times violent film. The pacing seemed a little slow, especially in the beginning of the movie and I felt Eastwood could have cut a few moments here and there to bring the movie down to a solid 2 hours. The 2160p High Definition Video was a bit of a letdown. While the picture was clear, I felt it still didn't have the extreme crispness I'm used to with 4K. The colors were certainly strong but it just lacked something I can't quite put my finger on. The DTS-HD Master Audio 5.1 was again disappointing as there was little surround sound feeling. The dialog was clear and there was a good mix with the sound effects and music though. The extras are located on the Blu-ray disc and while they are plentiful and interesting, they don't offer any previously unreleased material. Unforgiven brought Eastwood to a whole new level of filmmaking and changed the concept of the old westerns. Munny is a flawed yet human character anyone can relate to and Hackman's performance is nuanced. With Father's day just over a month away, this is a worthwhile buy for the Western-loving man in your life. 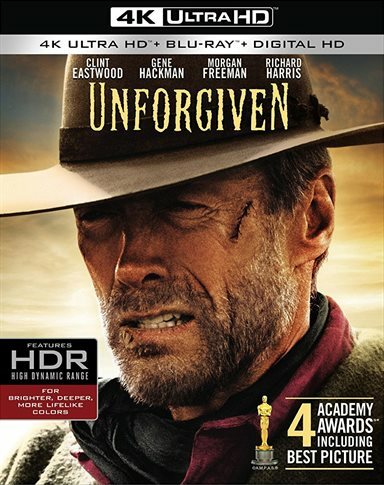 Download Unforgiven from the iTunes Store in Digial HD. For more information about Unforgiven visit the FlickDirect Movie Database.